Are you planning to tie the knot in a Northern Virginia elopement? Northern Virginia has so many small towns and beautiful cities where you can opt to elope with your sweetheart. 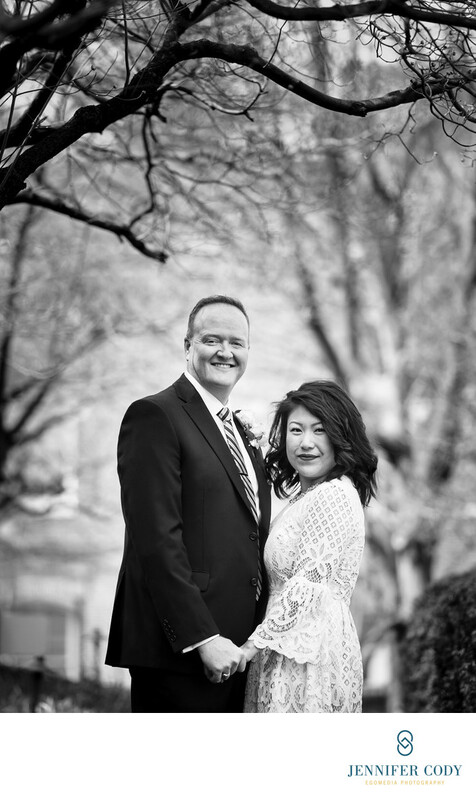 This particular Northern Virginia elopement took place in Old Town Alexandria on an early spring day! Old Town is a lovely, historic town with beautiful parks, cobblestone streets, and of course, a big city hall! It's not the only place to get married in Northern Virginia, but it's one of my favorite locations! When you're planning your Northern Virginia elopement, it might help to first envision what kind of surroundings would be the right ones for the two of you. Do you picture a historic town with row homes, like Old Town Alexandria? Do you picture a modern, urban atmosphere with high-rises, like Arlington? Or would you prefer to say your vows among beautiful vineyards and mountains? You could elope in Purcellville, Middleburg, Deplane, Leesburg, or Lovettsville! Beautiful wineries abound in Northern Virginia and they make a gorgeous backdrop for elopement photographs. Eloping in Northern Virginia, or really anywhere in the Commonwealth couldn't be easier! You can visit the Clerk of the Circuit Court of any county in Virginia. The license cost is $30 and there are no blood tests required. There is no waiting period in Virginia, so you can technically obtain your marriage license on the same day of your elopement! However, it may be easier and less hectic to procure it in advance. Once you have your marriage license from any county, you can elope anywhere in the Commonwealth of Virginia, which makes things easy! Location: 520 King St, Alexandria, VA 22314.